On March 29th, British Prime Minister Theresa May handed over a notification of withdrawal to Brussels. This move triggered the two-year countdown for Britain’s exit from the EU. While the European Commission will officially conduct the talks for the EU side, the governments of the EU member states will want to stay deeply involved, given what is at stake. Many people expect Germany to take a prominent role in these talks, and that this role will be shaped mainly by the interests of its powerful exporting companies. I believe both assumptions are wrong. For most Germans, Brexit really does not matter much. Even Europe as a whole hardly features on the list of German preoccupations at the moment. Nor is Brexit a big issue in political circles. Whenever German politicians do speak about Brexit publicly, they tend to repeat what it should not be (“cherry picking”, “dismantling the single market”) rather than what it should look like. German business is another matter. The British government is right to say that there is a lot at stake for the German economy. In 2016, Germany exported €86 billion worth of goods to the UK, while imports from the UK were less than half that. Some 750,000 jobs in Germany are said to depend on exports to the UK. And 2,500 German companies are active in the UK, having invested €120 billion there. Will Chancellor Angela Merkel cave in to the demands of German companies and adopt a softer stance in the negotiations, like many Brits expect? In the past, German foreign policy was indeed often driven by economic interests. But that is not necessarily the case today. The sanctions on Russia are an important precedent: even the strongest lobbying groups could not sway Berlin’s determination to sanction Russia for the annexation of Crimea. Merkel’s priority is to keep the EU27 together and protect the EU’s achievements. 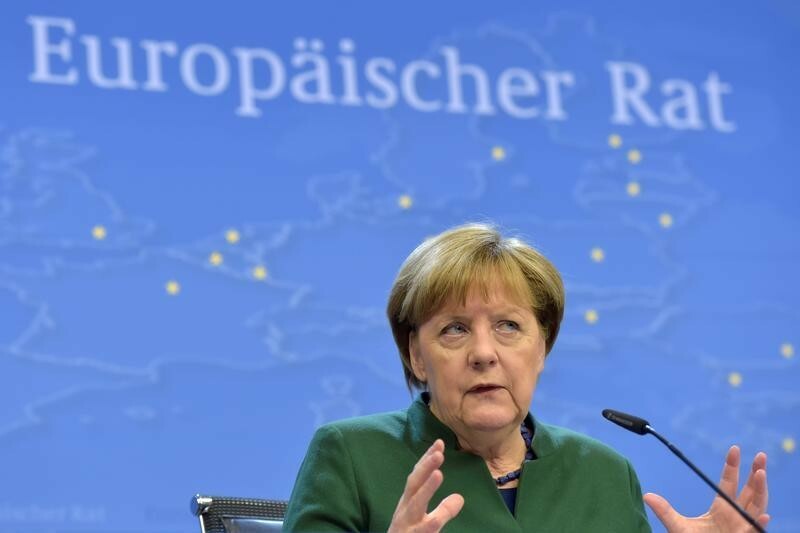 Speaking to the German employers federation in 2016, Merkel explicitly asked the assembled business leaders to put the sanctity of the single market above their individual business interests. And, indeed, for many German companies, maintaining their pan-European supply chains (which, for example, link German car assembly plants with suppliers in Central Europe) is more important than preserving the business they do with the UK. While Germany is unlikely to take a soft approach, it is not out to “punish” Great Britain either. That is not to deny that there is disappointment. “The Brits have always been half-hearted members”, many Germans complain. And many more are puzzled that a country could go into such a momentous referendum totally unprepared for the outcome. But Germans also remember the UK’s great contributions to the EU – the single market, eastward enlargement, the common security policy – and they hope that the country can stay a close and constructive partner . Angela Merkel is not, in any case, a politician who will approach the negotiations based on the emotions of either disappointment or nostalgia. She is a pragmatist. And while British politicians often point to domestic political constraints when explaining their EU policies, it is important to remembers that Brexit is only a small part Merkel’s agenda in 2017. From the complex task of integrating vast numbers of refugees, to the smouldering conflict in Ukraine and dealing with an unpredictable Donald Trump in the US and increasingly belligerent Recep Erdoğan in Turkey, Angela Merkel has got her work cut out. She has to deal with all these challenges while fighting a difficult campaign ahead of her country's September elections . Whatever the outcome of this vote, it will be fought not on foreign policy issues, such as Brexit, but on domestic issues, most notably immigration, security and social justice. Add to this complex mix of negotiations the fact that Germany is seeking to redefine its role in Europe and the world, and it becomes clear that various different motivations flow into Germany’s Brexit negotiating stance – some of which have little to do with Brexit. Many of Germany’s European neighbors have been calling on Berlin to show more “leadership” – although the way they define this, often in terms of Germany paying more money to poorer neighbors or assuming some of their debt – does not accord with German ideas of national responsibility. Many Germans were disappointed when Berlin showed “leadership” in the refugee crisis but many EU partners allowed in only few of the new arrivals. Against this background, Germans are now pondering the question of what leadership in Europe means, what price they are prepared to pay and what the responsibilities of other EU countries should be. The election of Donald Trump led some commentators to declare Angela Merkel “the leader of the free world”, a job offer that she vigorously rejected. Such debates about leadership are not easy for Germans, for historical and other reasons, which makes it unlikely that Berlin will seek a prominent role in the impending Brexit negotiations. On the contrary, Berlin will want to stay as close as possible to Paris (assuming Marine Le Pen does not win the presidency in May), in an attempt to rekindle the Franco-German partnership after a difficult decade. Hence, if you want to know how Germany will define its Brexit negotiating stance, you might also want to look to France. This article is based on a speech at Chatham House, London, in December 2016. The views expressed here are the author’s own and do not reflect that of any organization.